The Cassini spacecraft ended its mission on September 15th, 2017, when it crashed into Saturn’s atmosphere, thus preventing any possible contamination of the system’s moons. Nevertheless, the wealth of data the probe collected during the thirteen years it spent orbiting Saturn (of the gas giant, its rings, and its many moons) continues to be analyzed by scientists – with amazing results! Case in point, the Cassini team recently released a series of colorful images that show what Titan looks like in infrared. The images were constructing using 13 years of data that was accumulated by the spacecraft’s Visual and Infrared Mapping Spectrometer (VIMS) instrument. These images represent some of the clearest, most seamless-looking global views of the icy moon’s surface produced so far. Infrared images provide a unique opportunity when studying Titan, which is difficult to observe in the visible spectrum because of its dense and hazy atmosphere. This is primarily the result of small particles called aerosols in Titan’s upper atmosphere, which strongly scatter visible light. However, where the scattering and absorption of light is much weaker, this allows for infrared “windows” that make it possible to catch glimpses of Titan’s surface. It is because of this that the VIMS was so valuable, allowing scientists to provide clear images of Titan’s surface. This latest collection of images are especially unique because of the smoothness and clarity they offer. In previous infrared images captured by the Cassini spacecraft of Titan (see below), there were great variations in imaging resolution and lighting conditions, which resulted in obvious seams between different areas of the surface. This is due to the fact that the VIMS obtained data over many different flybys with different observing geometries and atmospheric conditions. As a result, very prominent seams appear in mosaic images that are quite difficult to remove. But, through laborious and detailed analyses of the data, along with time consuming hand processing of the mosaics, Cassini’s imaging team was able to mostly remove the seams. The process used to reduce the prominence of seams is known as the “band-ratio” technique. This process involves combining three color channels (red, green and blue), using a ratio between the brightness of Titan’s surface at two different wavelengths. The technique also emphasizes subtle spectral variations in the materials on Titan’s surface, as evidenced by the bright patches of brown, blue and purple (which may be evidence of different compositions). In addition to offering the clearest and most-seamless glimpse of Titan yet, these unique images also highlight the moon’s complex geography and composition. They also showcase the power of the VIMS instrument, which has paved the way for future infrared instruments that could capture images of Titan at much higher resolution and reveal features that Cassini was not able to see. 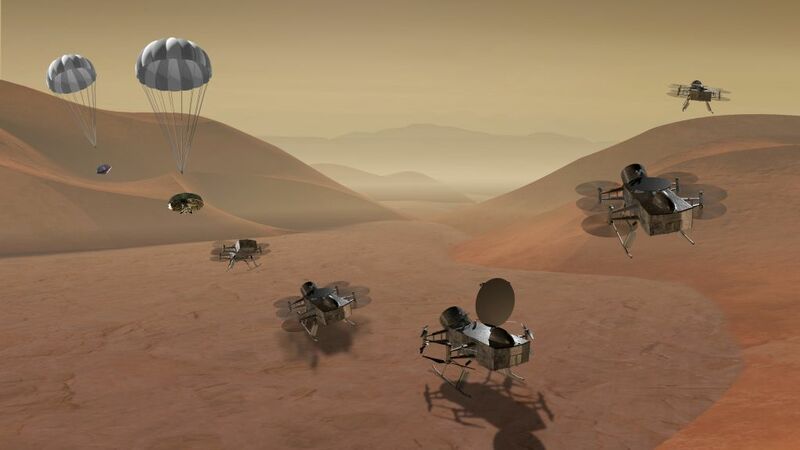 In the coming years, NASA hopes to send additional missions to Titan to explore its surface and methane lakes for signs of biosignatures. An infrared instrument, which can see through Titan’s dense atmosphere, provide high-resolution images of the surface and help determine its composition, will prove very useful in this regard! Thanks to the Cassini mission, we have learned some truly amazing things about Saturn and its largest moon, Titan. This includes information on its dense atmosphere, its geological features, its methane lakes, methane cycle, and organic chemistry. And even though Cassini recently ended its mission by crashing into Saturn’s atmosphere, scientists are still pouring over all of the data it obtained during its 13 years in the Saturn system. And now, using Cassini data, two teams led by researchers from Cornell University have released two new studies that reveal even more interesting things about Titan. In one, the team created a complete topographic map of Titan using Cassini’s entire data set. In the second, the team revealed that Titan’s seas have a common elevation, much like how we have a “sea level” here on Earth. The two studies recently appeared in the Geophysical Research Letters, titled “Titan’s Topography and Shape at the End of the Cassini Mission” and “Topographic Constraints on the Evolution and Connectivity of Titan’s Lacustrine Basins“. The studies were led by Professor Paul Corlies and Assistant Professor Alex Hayes of Cornell University, respectively, and included members from The Johns Hopkins University Applied Physics Laboratory, NASA’s Jet Propulsion Laboratory, the US Geological Survey (USGS), Stanford University, and the Sapienza Universita di Roma. In the first paper, the authors described how topographic data from multiple sources was combined to create a global map of Titan. Since only about 9% of Titan was observed with high-resolution topography (and 25-30% in lower resolution) the remainder of the moon was mapped with an interpolation algorithm. Combined with a global minimization process, this reduced errors that would arise from such things as spacecraft location. The map revealed new features on Titan, as well as a global view of the highs and lows of the moon’s topography. For instance, the maps showed several new mountains which reach a maximum elevation of 700 meters (about 3000 ft). Using the map, scientists were also able to confirm that two locations in the equatorial regions are depressions that could be the result of ancient seas that have since dried up or cryovolcanic flows. Looking ahead, this map will play an important role when it comes tr scientists seeking to model Titan’s climate, study its shape and gravity, and its surface morphology. In addition, it will be especially helpful for those looking to test interior models of Titan, which is fundamental to determining if the moon could harbor life. Much like Europa and Enceladus, it is believed that Titan has a liquid water ocean and hydrothermal vents at its core-mantle boundary. This common elevation is important because liquid bodies on Titan appear to be connected by something resembling an aquifer system. Much like how water flows underground through porous rock and gravel on Earth, hydrocarbons do the same thing under Titan’s icy surface. This ensures that there is transference between large bodies of water, and that they share a common sea level. Meanwhile, smaller lakes on Titan appear at elevations several hundred meters above Titan’s sea level. This is not dissimilar to what happens on Earth, where large lakes are often found at higher elevations. These are known as “Alpine Lakes”, and some well-known examples include Lake Titicaca in the Andes, Lakes Geneva in the Alps, and Paradise Lake in the Rockies. 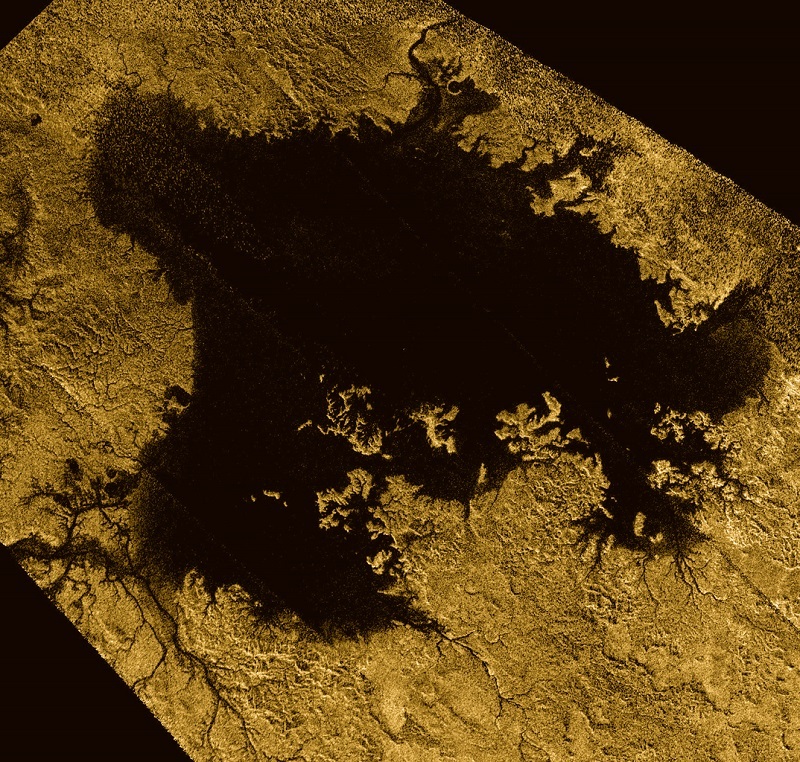 Last, but not least, the study also revealed the vast majority of Titan’s lakes are found within sharp-edged depressions that are surrounded by high ridges, some of which are hundreds of meters high. Here too, there is a resemblance to features on Earth – such as the Florida Everglades – where underlying material dissolves and causes the surface to collapse, forming holes in the ground. The shape of these lakes indicate that they may be expanding at a constant rate, a process known as uniform scarp retreat. In fact, the largest lake in the south – Ontario Lacus – resembles a series of smaller empty lakes that have coalesced to form a single feature. This process is apparently due to seasonal change, where autumn in the southern hemisphere leads to more evaporation. While the Cassini mission is no longer exploring the Saturn system, the data it accumulated during its multi-year mission is still bearing fruit. Between these latest studies, and the many more that will follow, scientists are likely to reveal a great deal more about this mysterious moon and the forces that shape it!